Abstract: This project aims to analyze the problem of violence, starting from the structural articulation of five sets of constitutive phenomena: intersubjectivity, affectivity, embodiment, spatiality, and temporality. The premise of our research is that phenomenology, by virtue of its focus on the concrete experience of subjectivity, of its specific conceptual endeavor, as well as of its descriptive approach, has a remarkable theoretical potential to uncover the interwoven meanings of violence, but also to elaborate a unitary view of this phenomenon. The purpose of our project is to explore the phenomenon of violence in its structural genesis crossing the totality of its constitutive layers, in order to understand the articulated variations of this phenomenon and its possible concretizations. Our project aims to show that an integrative phenomenology of violence can be developed only in the interstices linking the phenomenology of intersubjectivity (the problem of the hostile other, understood in its adversity, as conflicting alterity), the phenomenology of affectivity (the emergence of irritation and anger as condition of the conflict) and the problem of embodiment (the question of pain and vulnerability targeted by each of the poles involved in the factical situation of violence, having as its limit the murder, the ultimate violence), as well as in relation to the way in which the structure of the phenomenon modalizes itself depending on the essential possibilities of spatiality and temporality. The innovative character of our project is that it aims to investigate the phenomenon of violence in a radial way, in relation to the entire network of issues opened by the five essential structures (intersubjectivity, affectivity, embodiment, spatiality and temporality), aiming to lay the grounds for an integrative phenomenological theory of violence, able to explain the articulation of different types of violence in relation to the variation of its constitutive dimensions. Dr. Cristian Ciocan has a Ph.D. from the University of Bucharest (2006) and a Ph.D. from the University of Paris IV – Sorbonne (2009). He is currently Assistant Professor at the University of Bucharest, Center of Excellence in Image Study (CESI), member of Doctoral School of Philosophy of the University of Bucharest, President of the Romanian Society for Phenomenology (founded in 2000), and Editor-in-Chief of the journal Studia Phaenomenologica. He was Postdoctoral Research Fellow of the Alexander von Humboldt Foundation at the University “Albert-Ludwig” in Freiburg im Breisgau (2007-2008) and of the New Europe College (2009-2010). He was Principal Investigator for other research projects, such as The Body In-Between. An Interdisciplinary Approach to an Integral Theory of Corporeal Phenomena (2010-2013) and Phenomenological Approaches to the Anthropological Difference. (2015-2017). He is editor of the Newsletter of Phenomenology, and of the Newsletter of Romanian Philosophy. In 2009, he received the prize In hoc signo vinces for research excellence, awarded by CNCSIS (National University Research Council). Recent works: Heidegger et le problème de la mort: existentialité, authenticité, temporalité (Springer, “Phaenomenologica”, 2014); Lectures de Jean-Luc Marion (Cerf, 2016, in collaboration with Anca Vasiliu); Phénoménologie de la vie animale (Zeta Books, 2016, in collaboration with Florence Burgat). For the publications list, click here. Dr. Ion Copoeru (PhD 1999) teaches philosophy and ethics at Babeş-Bolyai University Cluj-Napoca. His research interests are located mainly in phenomenology (intersubjectivity and normativity, particularly in the work of Husserl and Schutz) and ethics in professions, with focus on the professions of law and healthcare. He is author of Aparenţă şi sens [Appearence and meaning] (2000) and Structuri ale constituirii [Structures of Phenomenological Constitution] (2001), editor or co-editor of several collective volumes, such as Phenomenology 2005, Vol. III (with Hans Rainer Sepp) (Zeta Books, 2007), Phenomenology 2010, Vol. III (with P. Kontos and A. Serrano) (Zeta Books, 2011), Recherches phénoménologiques actuelles en Roumanie et France (with Alexander Schnell) (Olms, 2006). Also, he published a series of studies and articles, the following being the most relevant: “Understanding Addiction: A Threefold Phenomenological Approach”, in: Human Studies (2014) 37.3: 335-349; “A Schutzian Perspective on the Phenomenology of Law in the Context of Positivistic Practices”, in: Human Studies (2008) 31:269-277 DOI: 10.1007/s10746-008-9097-6. Dr. Ileana Borțun received her PhD in Philosophy from the University of Bucharest (in 2014), with the thesis Shaping an Existential Ethics by Identifying the Connections between Metaphysics and Totalitarianism, arguing for the possibility of developing an ethics starting from Heidegger’s existential analytic from Being and Time, through a constructive dialogue especially with Lévinas’s and Arendt’s critiques of it and by taking the kinship between metaphysics (in Heidegger’s interpretation) and totalitarianism (in Arendt’s interpretation) as a negative reference point. Ileana Borţun also received, in 2002, a BA in Communication Sciences (from the Communication and Public Relations Department – the National School of Political Sciences and Public Administration, Bucharest); in 2003, an MA in Nationalism Studies (from the Nationalism Studies Department – C.E.U., Budapest); in 2008, a BA in Philosophy and, in 2010, an MA in Philosophy (from the Philosophy Department – University of Bucharest). Dr. Ciprian Jeler is a doctor in philosophy from the universities “Charles de Gaulle – Lille 3” and “Al. I. Cuza” (Iaşi), with a thesis bearing on Henri Bergson’s theory of action.He is a researcher at the Interdisciplinary Research Department – Human and Social Sciences of the “Al. I. Cuza” University. His philosophical interests are spread between contemporary French philosophy (from Bergson to Meillassoux) and philosophy of evolutionary biology (and especially multi-level selection theory). Some recent publications: “« Résister à la résistance »: l’implacable et la ressource”, in Annales bergsoniennes, t. VI, Shin Abiko, Arnaud François, Camille Riquier (éds.) PUF, Paris, 2013, pp. 297-220 ; “Is There Such a Thing as ‘Group Selection’ in the Contextual Analysis Framework?”, History and Philosophy of the Life Sciences, vol. 36, issue 4, 2015, pp. 484-502; “Multi-level selection and the issue of environmental homogeneity”, Biology & Philosophy, doi: 10.1007/s10539-017-9578-y, 2017. 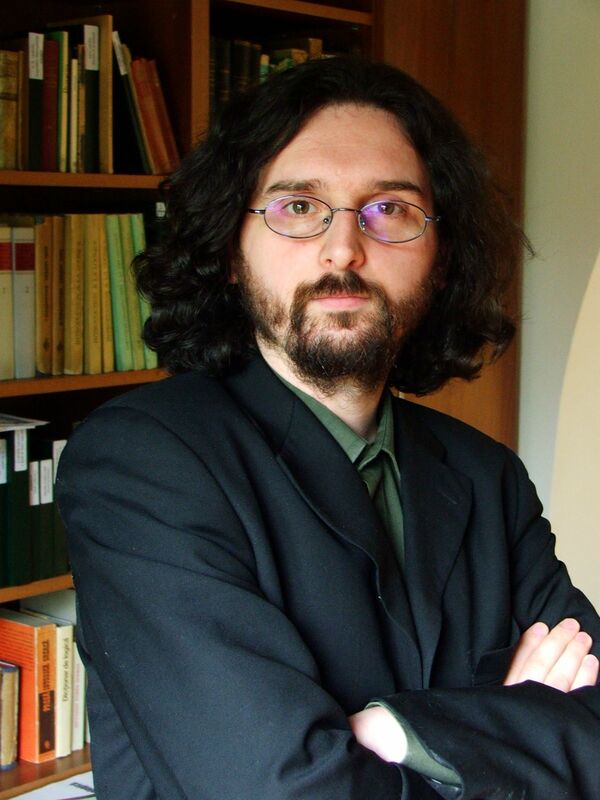 Dr. Paul Marinescu has a PhD at the University of Bucharest and the University Lyon 3 (2011), with a thesis on “The Universality of Hermeneutics”. He worked as postdoctoral researcher at the Alexandru Dragomir – Institute for Philosophy, Romania (2011–2013). He was Postdoctoral Research Fellow of the French Government (2015) and the Romanian Academy (2014–2015). He published several articles in international journals such as Ricoeur Studies, International Journal of Philosophy and Theology, Archivio di Filosofia. He co-edited two volumes of collected studies: Timp, memorie si traditie. Studii de fenomenologia istoriei (2012); Figuri ale vulnerabilitatii existentiale. De la uitarea de sine la uitarea fiintei (2013). He also co-edited Studia Phaenomenologica volume: “On the Proper Use of Phenomenology. Paul Ricoeur Centenary” (2013). He translated into Romanian several works by Paul Ricoeur, Eric de Rus, et al. His main areas of research are: Hermeneutics, Phenomenology and Historiography. Remus Breazu is a PhD candidate at the University of Bucharest. In his thesis, he is reconstructing the phenomenological concept of transcendental, being focused on the philosophy of Edmund Husserl and Martin Heidegger. His main interests are phenomenology, transcendental philosophy, ancient Greek philosophy, and the history of Romanian philosophy. Cătălina Condruz is a PhD Candidate at the Department of Philosophy, University of Bucharest. Her main interests concern the role of intentionality in the history of phenomenology, the connection between the notion of intentionality and alterity in the phenomenology of givenness, and the phenomenological discourse applied to visual arts. Her thesis focuses on Marion’s concept of counter-intentionality as a possibility to describe the constitution of alterity. During her BA, she was involved in Erasmus programme and spent a semester as a student at University of Rouen (France). She is a member of the Center for Phenomenological Studies (CSF). Other research interests include: philosophy of art, philosophy of religion, Romanian philosophy. 2 open positions (part time) for doctoral students starting with the 1st of October. UB / ANCS / EURAXESS. Ion Copoeru, “Categorization as a form of violence (the case of addiction)”. Rethinking Disease. New Theoretical Foundations for Clinical Treatment, 10 November 2017, IRH. Cristian Ciocan,“The emergence of violence and the modifications of intersubjectivity”. New research in phenomenology, psychology and psychoanalysis, Cluj, 24-25 November 2017. Ciprian Jeler, “Violence and objectivation”. New research in phenomenology, psychology and psychoanalysis, Cluj, 24-25 November 2017. Cătălina Condruz, “The television as a violence of the Visible”. New research in phenomenology, psychology and psychoanalysis, Cluj, 24-25 November 2017. Remus Breazu, “Heidegger on violence”. New research in phenomenology, psychology and psychoanalysis, Cluj, 24-25 November 2017. Ion Copoeru, “Categorization as a form of violence”. New research in phenomenology, psychology and psychoanalysis, Cluj, 24-25 November 2017. Special issue edited by Paul Marinescu, in collaboration with Ludger Hagedorn: Meta: Research in Hermeneutics, Phenomenology, and Practical Philosophy, vol. IX (2) Dec. 2017 // Exploring the Undisclosed Meanings of Time, History, and Existence: Paul Ricœur and Jan Patočka as Philosophical Interlocutors. 5 articles submitted to international journals.